Quizam Media Corporation is pleased to announce that the first university credit course integrating ontrackTV videos launched on schedule Friday, January 9. Dr. Tracy Ryder Glass, UFV’s Dean of Professional Studies, and Cindy Stewart, associate professor of business, joined Vicki Asada and David Lee, directors of Quizam Media Corporation, for the ribbon-cutting ceremony to commemorate kick-off. The launch party was scheduled for 8:30 am at the UFV Clearbrook Centre. 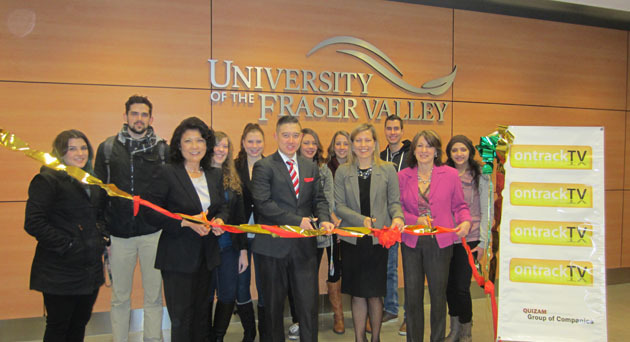 Under the terms of the MOU signed April 2, 2014 , the partnership formalized a path for developing UFV’s project plan to access and customize ontrackTV (www.ontracktv.com) content for labs, self-paced learning, and other purposes related to UFV credit and non-credit courses. The goal is for UFV to work with ontrackTV to help meet UFV’s strategic plan goals for online delivery. The first course to pilot the blended learning delivery is BUS 329 — Brand Identity Management, offered by the UFV School of Business.. In this pilot, students will be required to attend two-hour classes instead of three hours, with the third hour allocated to assignments using ontrackTV videos and textbooks. The blended learning format shifts the learning of standard content (computer applications for applied branding) to the student, with video playlists and assignments completed prior to the next lecture. This frees the instructor to focus less on delivery of content and more on fostering discussion, critical thinking, and creativity to help students to meet the learning objectives. “ Students will be learning and using training videos in the same way ontrackTV corporate clients are by accessing computer application lessons on an as-needed basis, at any time, from any device,” says David Lee, Director of On-Track Corporate Training.